The past week has been extremely stressful and hard. It's been full of arguments, tears, stress and more tears. 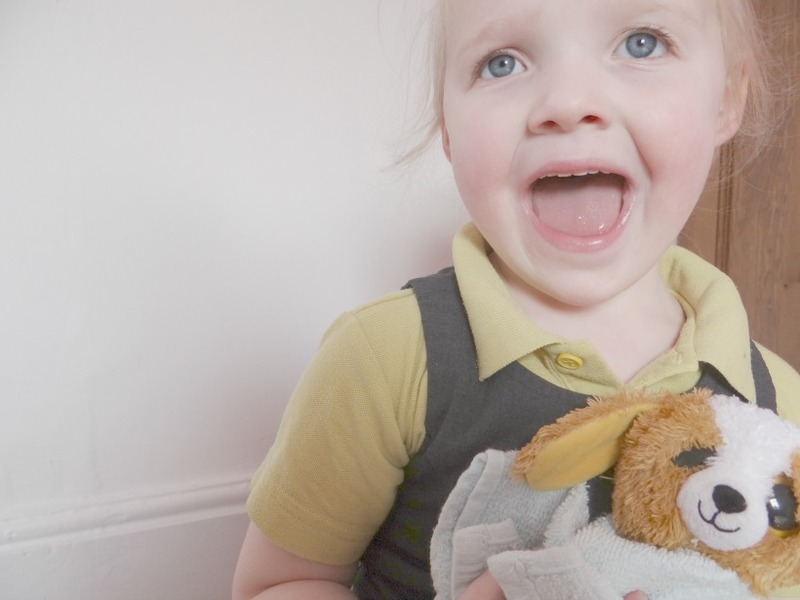 My youngest daughter, Elliw has been a right little madam. I am not quite sure where she has got this phase from or how it even appeared but her behaviour and attitude was so difficult to cope with. It started all of a sudden and it didn't help that I have also been struggling with aches and pains from pregnancy symptoms too. I had only gotten over the stress I had the previous week because of my eldest. So to all of a sudden be stressed again, did take its toll on me. All week I have been feeling shattered and all over of the place. Elliw is only part-time school, so although I had a couple of hours break when she was in school for 2 hours, it did go too fast as I always had something to do. I fell back with housework but I have finally gotten on top of it. I fell back on blog work too but I have gotten on top of that too - which I am glad and proud of. Elliw has been very demanding. She has always been pretty demanding anyway, but the past week has been 10x worse. She will scream in my face, lose her temper pretty badly and be pretty aggressive. All week she has been pretty impatient and just a right handful. She wasn't settling at night for a good couple of hours, coming out of bed over 10 times an evenings for a good few days but finally she slept straight away Friday and Saturday evening, which made me less stressed in the evenings. All parents love their quiet evenings, don't they? 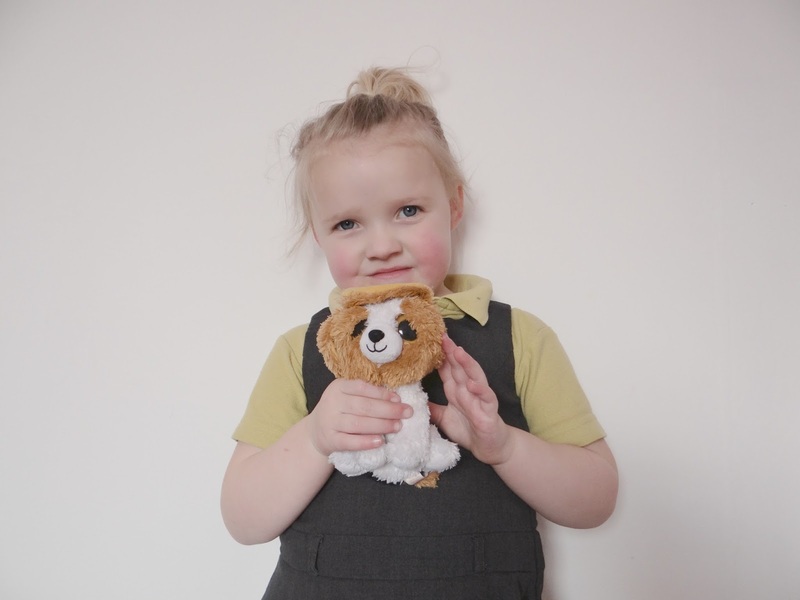 On Friday I went to pick her up from dinner club and her teacher told me before going that she got to take Loli the listening dog home with her because she had listened in school all day. I had a huge smile on my face and everything that happened all week was forgotten about. I arrived at the cabin where the dinner club is and I could see her sitting there. 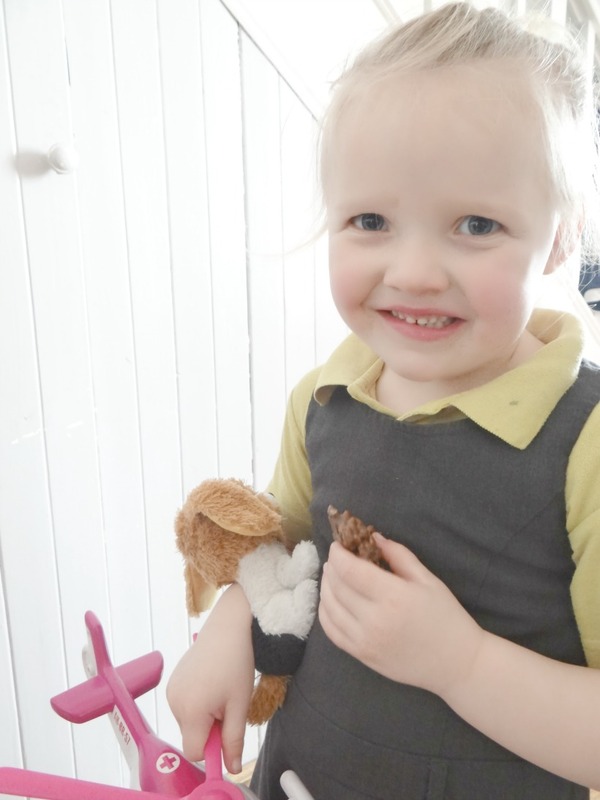 She caught me and was so excited to show me Loli the dog that she forgot her packed lunch on the table! She was so excited. I was hoping this would change her behaviour. I took a few photos of her and Loli for her book to take back to school and she loved posing for the camera with Loli. She then took Loli to brush her teeth and even took her on the walk to school to pick Mia up. Mia was so happy for Elliw too! Elliw was really proud showing Loli off and even shared Loli with Mia. Elliw's behaviour didn't really change because she instantly played up near bedtime and laughing right in my face when she had a row off me or even when I kind of spoke to her calmly. It did get to much and I had to tell her that I would take Loli off her and back to the teacher if carried on. As I walked off I still heard a tiny giggle but I ignored and I am glad I did because not long after, she was sleeping! Over the weekend she hasn't been to bad and she has been pretty well behaved. She still has her little tantrums but not half as bad as what she has been during the week, which I am so glad and hoping it's over now. I look at her playing or cuddling her and I just think, she will only be youngest child for the next 4 months. Another baby will be arriving. I remember Mia playing up big time when I was pregnant with Elliw, so maybe it's a similar thing but I just need to remember to stay calm and stop stressing out. I won't be having these times with her again. One day she will be her own person and have her own life somewhere else. I will want these temper tantrums back. I need to stop my pregnancy hormones controlling me and I need to learn how to control my feelings. She is my little girl, my baby. Just like Mia. My girls are my world. They are both going to be such a fantastic big sister to their little brother. These are lovely photos! All children go through these stages - often it's frustration or playing up for your attention. It could, as you say, be because she knows there is a new baby on the way and she's wondering how that is going to impact your relationship. Hopefully it passes for you soon! Everything is a phase! A wise person once told me that... just as you've nearly torn out all your hair, it usually passes. Fingers crossed! It's hard not to stress out yourself when our children play up - let alone adding in pregnancy hormones into the mix too! She knows change is on its way so it could be her way of getting attention from you? Either way I hope it settles down for you soon.